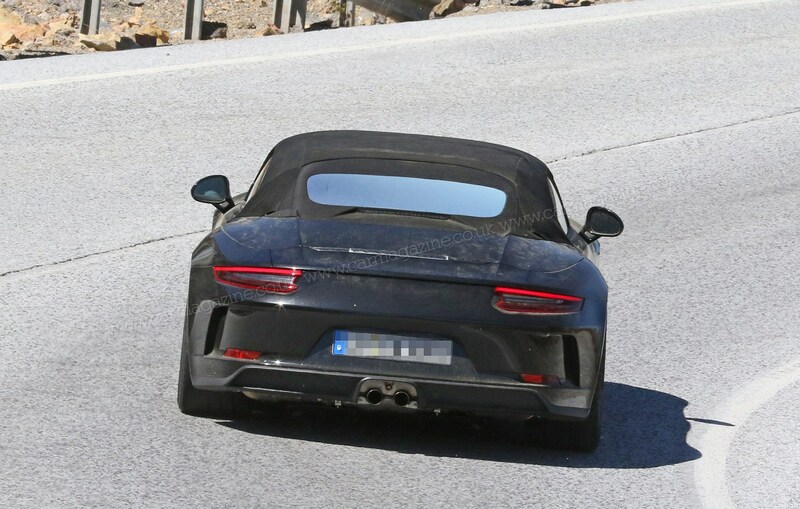 Remember the Porsche 911 Speedster concept car unveiled a few weeks ago? As we reported then, this is no one-off - it's destined for production, and it'll look very like this. 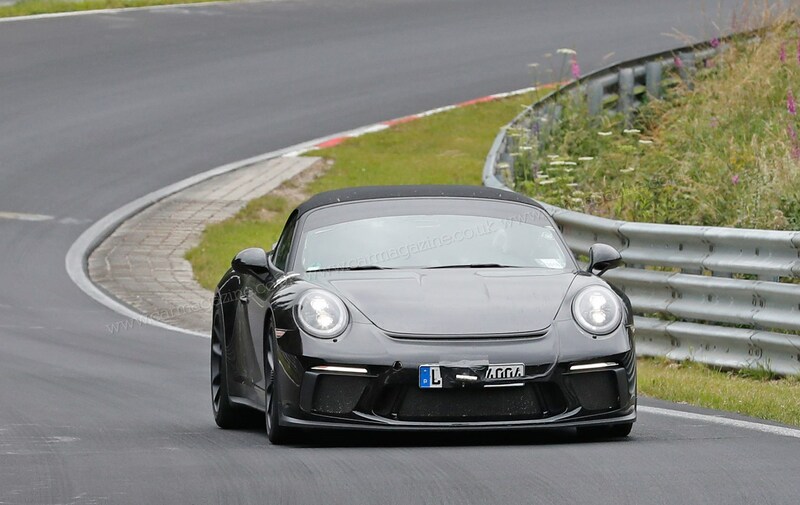 Our new spy photos capture the new flagship soft-top hot-footing around the Nurburgring. There's precious little camouflage on this 991.2 Speedster, and we get a good look at its new canvas roof, delicately stretching over a new double-bubble aero deck in lieu of rear seats. And check out the new whale tail! A vast rear spoiler is visible on this prototype, as engineers hone the package ahead of its world debut this summer. It should come as no surprise that Porsche is the master of niche-filling; go to the official website today and you'll find 24 - twenty four! - derivatives in the 911 price list. 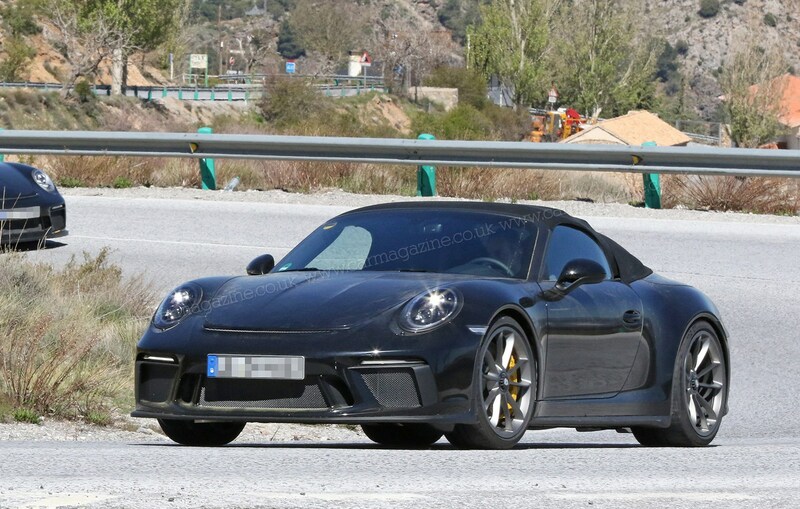 And soon there'll be another one, although we don't expect it to remain on sale for long - the new 2018 Porsche 911 Speedster. Built by the GT division responsible for the most extreme, and exclusive, Porsches, the Speedster is one of the final swansongs for the 991 generation before the new 992 arrives in autumn 2018 at the Los Angeles motor show. 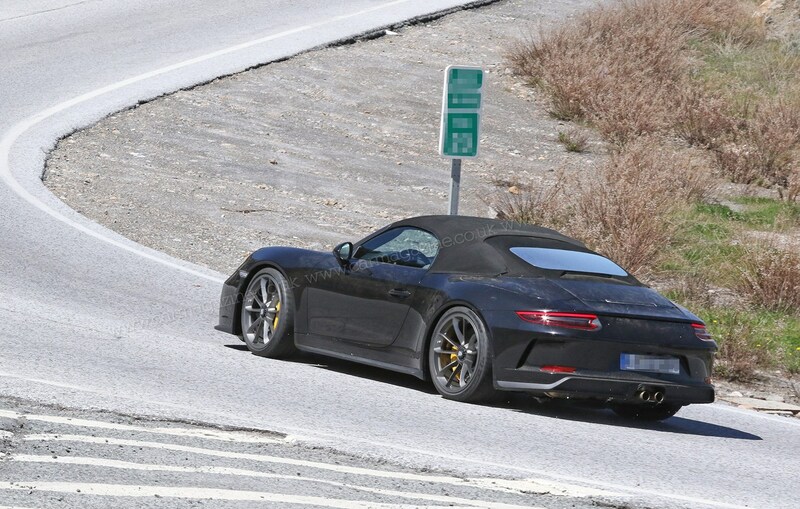 Our new spy photos capture the 911 Speedster on test in the Spanish mountains, as engineers finalise the calibrations for this al fresco nine-eleven. The 4.0-litre naturally aspirated flat six engine makes another appearance - with a rumoured 500bhp for a spine-tingling soundtrack and lashings of performance. 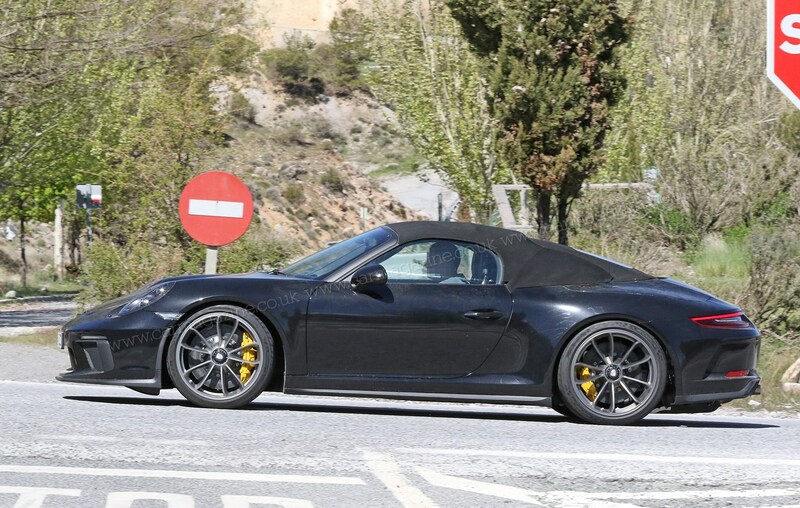 The Speedster is essentially an open-top GT3 and we understand that the six-speed manual gearbox will be offered. The lucky few buyers will pick the Speedster for its bodywork as much as its hardware. The rear seats are likely to be sacrificed in the name of an extended rear deck, hidden on this prototype whose roof is firmly up. And check out the angle of the front windscreen; it is lowered for a stubby, poised aesthetic. 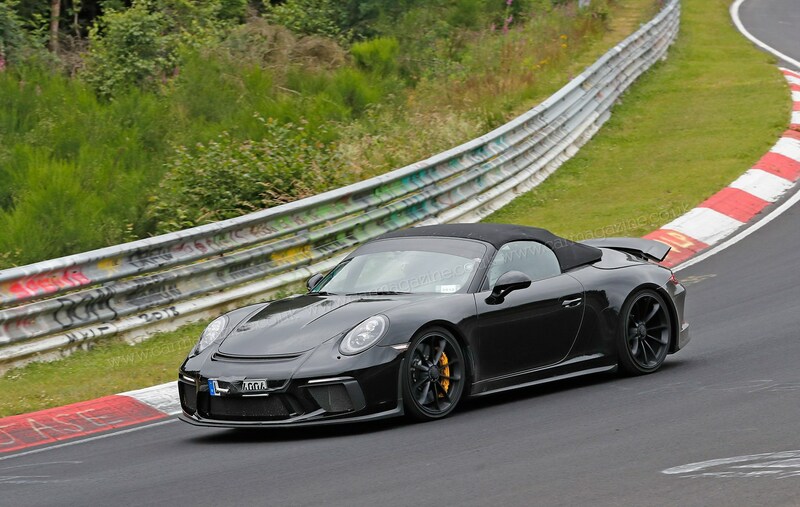 When can I buy the new 991-generation Porsche 911 Speedster? We expect it to be unveiled at an event this summer, probably at the museum in June 2018; but there'll be other chances to see the car, including at the Goodwood Festival of Speed and an historic motorsport event at Montlhéry outside Paris in July 2018. How many will be built? Very few: we hear just 1948 will be produced, making this a very special birthday present to the Porsche community. 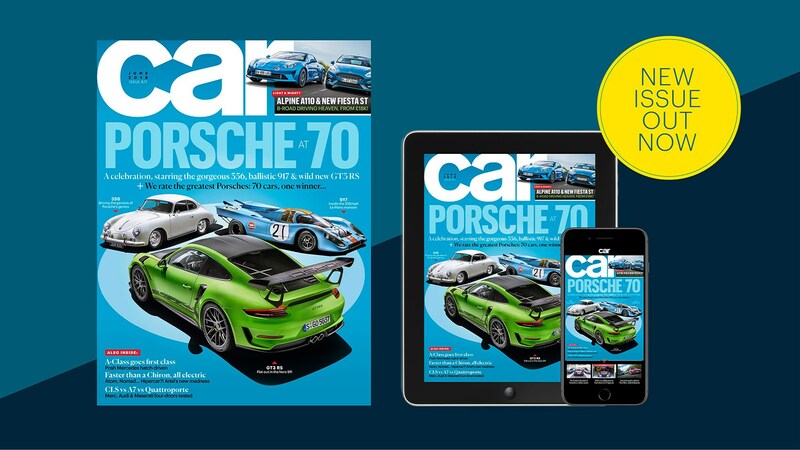 The brand celebrates its 70th anniversary this year and that is the year it was founded as a road car manufacturer (see the June 2018 issue of CAR magazine, above). The last 911 Speedster, the 997, followed a similar path, although it wasn't built by the GT department: just 356 examples were sold. It cost £144,000 back in 2010 so you can be sure that the new 991 Speedster will be a very seriously priced convertible indeed. We wouldn't be at all surprised to find that price pushing past £200k, like the latest GT2 RS. Great Britain is the fourth biggest market for Porsche globally, and even higher up the pecking order for sports cars. No word yet on how many Speedsters will make it to the UK in right-hand drive, but the few hundred likely to arrive won't hang around long (in any sense of the phrase).